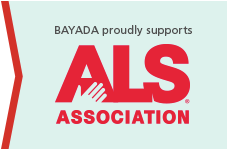 As a National Gold Level Sponsor for The ALS Association’s Walk to Defeat ALS, Team BAYADA actively participates in local events throughout the year. Our local offices also rally together to raise additional funds for the walks in their service areas. In 2015, Team BAYADA attended 14 Walk(s) and attended several other local ALS Association events throughout the year, including the North Carolina Clinical Conference. We believe that raising awareness about ALS will make a significant difference in the fight against ALS. Find a Walk to Defeat ALS near you.